These early laws clearly didn’t allow for a robot to be considered human, but later science fiction developed this concept further. The Star Trek franchise has explored robotics and the question of sentience in various ways, but the episode that specifically equated an artificial life form’s sentience with humanity was explored in detail on Star Trek: TNG in The Measure of a Man. In that episode, the crux of the issue under debate was whether Data, the android serving as the science officer aboard the Enterprise, was a device that could and should be dismantled to be studied, or a sentient life form, in essence, a man with individual rights. Uncanny Valley jumps into the fray exploring the boundaries between robots and humans, and trying to define what makes a person that specific person. Enter Claire (Mary Price Moore). She’s a septuagenarian neuroscientist who, along with her husband, has been working her entire career developing artificial consciousness, which goes beyond artificial intelligence. Artificial intelligence can be described as a machine processing information in an intelligent way. Artificial consciousness, on the other hand, adds that subjective aspect of feeling, or self-awareness by the machine doing the processing. 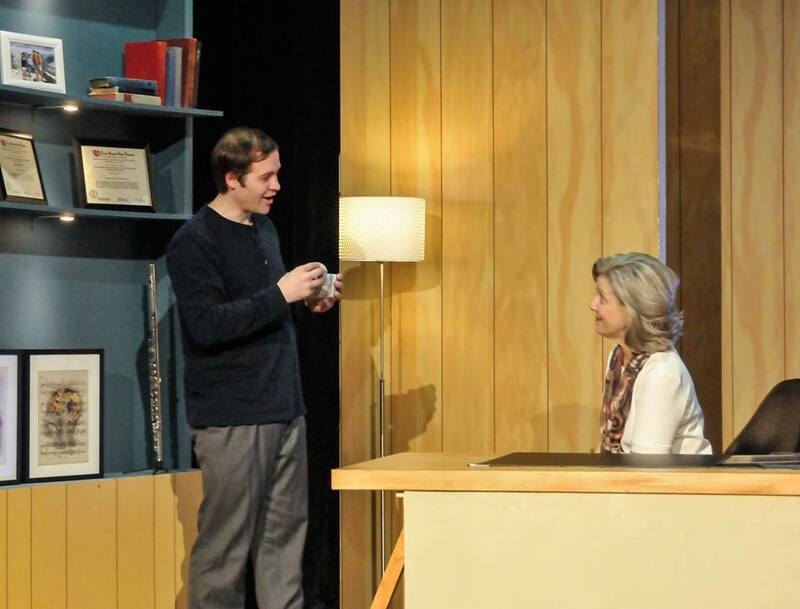 Julian (Evan Kokkila Schumacher) is Claire’s latest endeavor – a robot approximating a human male in his mid-thirties. 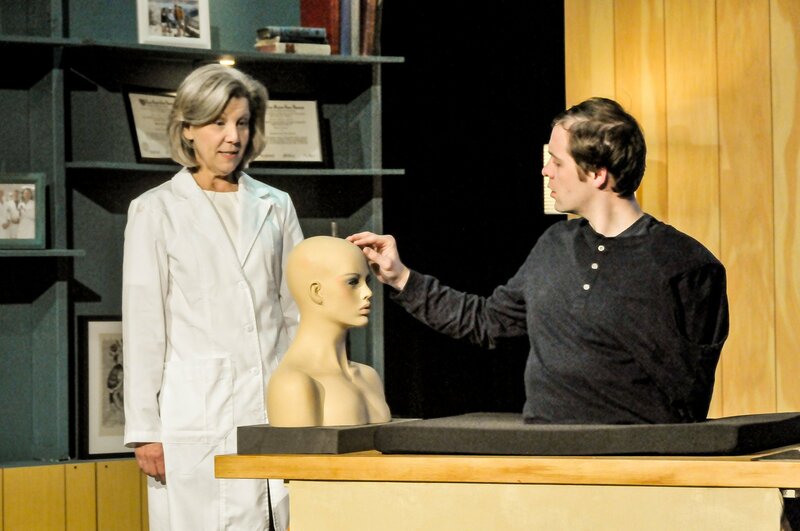 The play starts with Claire just beginning to awaken Julian’s artificial brain to teach him how to jump over the uncanny valley, i.e., to cross the divide between being almost, but not quite human, to becoming so close to the real thing that the two are indistinguishable. The plot follows Julian’s development, first with language and facial subtleties to full, fluid expression and locomotion. From early on, Julian asks why he has brown hair, blue eyes, and imperfect facial characteristics. At first, Claire tells him that he has to look like something. Eventually though, after he masters the skills and demonstrates the knowledge she set out to teach him and continues to ask, she tells him the real reason he was created. He was made with the physical attributes he has because the person who requested him is dying and intends to transfer his consciousness, as recorded by the life history department, into this artificial, younger version of himself in an effort to live on. Julian processes this information and perceptively points out that he is the cup into which this man intends to pour himself. From there, the play then explores a plethora of ethical issues, and the question of what really makes a person a person. There are several unexpected twists and turns along the way, and the ending leaves much for the audience to ponder. Jesse Dreikosen’s scenic inspiration is cozy. The set is Claire’s small, but comfortable office. There’s an antique-looking desk center right, a rolling desk chair, a large blue bookcase along the stage right wall, a couch stage left, and a translucent window taking up much of the upstage office wall. Several books and certificates adorn the bookcase, along with a bust of an earlier version of a female robot, a flute, and a small phrenologist’s head. A small rug sits under the desk and extends around it. A floor lamp sits up right of the desk. Director Caroline Clark’s artistic choices work well for the most part. The biggest challenge is in staging Julian’s physical development. He starts out as a talking head, and bit by bit is built up until the entire robot is visible. Rather than spoiling the illusion, it suffices to say that the creative choice for this progression is clever and credible. The play takes place in the near future, so nothing should be particularly futuristic, at least not jarringly so. The use of a clear tablet hints at the future without being out of place. The artistic choice of using what appears to be an invisible implant for a telephone, though plausible, isn’t entirely convincing. Moore’s Claire is empathetic, and smooth. She is not only comfortable in her skin, she moves with determination, and commands the authority a scientist with her years and quality of experience should have. Claire knows her stuff, and yet, she’s still a bit vulnerable. She has some skeletons in her closet, and Moore opens up just the right amount when some of those skeletons eventually issue forth. Schumacher’s Julian has a fascinating arc. At first, Julian is extremely robotic in both movement and tone, and Schumacher does this without looking forced, and he is able to provide some lighter moments. When Julian first gains an arm and a hand, he is instructed to feel various items to explore the differences in texture, temperature, and constitution. Along the way he is told to feel his face. Schumacher’s exploration of Julian’s physical facial textures and capabilities is both enlightening and extremely humorous. His facial contortions, aided by the “new” hand remind us of the wonder of a child. As the story progresses, Julian gains more expressiveness, broaching the uncanny valley toward “humanness” which Schumacher expertly shows very deliberately and believably. Of particular note is the skill with which Julian’s physical exploration proceeds. After the incremental successes as each arm is added, Julian is able to build on and apply what he’s learned much more quickly once his body is complete. Schumacher moves with ease and grace as he sweeps around the stage stretching Julian’s legs for the first time. His playfulness abounds as he tests the speed at which he can run in a tight circle, faster and faster, amazingly avoiding the dizziness that would normally strike all but the most highly trained dancers among us. Moore and Schumacher have shared the stage in previous productions, but never before in the intimate way that this two-person play requires. They must and do trust each other as there is no other focus here. Fortunately, they are up to the challenge, and their interactions, particularly in Act 2 when the discussion gets much more intense, are very authentic. Uncanny Valley is the perfect production to land at Pear Theatre, just a short walk from Google’s main campus in the heart of the Silicon Valley. The subject matter is one that is discussed regularly in numerous workplaces in the area. The presentation strikes the right balance between humor, drama, and thought-provoking questions brought forward by our impending technological advancements. While we are not currently facing the situations addressed in the play today, we well could be very shortly. Consider how much of a person can be automated, or replaced by mechanization and still remain human. Today, we can already transplant organs, or replace some artificially. We can replace joints, and even limbs with inorganic parts, but what of the brain? It’s sometimes a shorter distance between science fiction and science fact than we realize, and this production is guaranteed to spark some fascinating discussions even after you leave the theater – don’t miss it.